BugFix Fixed the contents of the build. Turns out it hadn't picked up the changes I made correctly, so it was using old code. I rebuilt it as release, and it seems to be working now. If you previously downloaded v3.6b prior to this update, please redownload it again. Apologies about the mixup. Adjustment Sprays should now be able to be installed for games that have it in their configs. Thanks to Devieus for showing me the correct pathing for Sprays. As it turns out, Sprays was the only type of non development submission (of the ones that make sense to install) that I had not added support for in Modboy itself. An oversight on my part, and one that this update fixes. If you have a previous version of Modboy downloaded, please download v3.6b to be up to date and have access to Spray installation. Thanks Northern3D for the configs! Note: Because this is a server-side change, using v3.6 will still work. Addition On the history page, each mod action record provides a link to the mod on Gamebanana. Improvement Made list vs grid view persist between launches. Addition (Server Side) Packed effects for TF2 are also supported, forgot to mention before. While originally planned for this release, filtering of mods on the overview page by submission type (skin, map, etc.) has been pushed out to the next release, pending a bit of design rework to make it fit better on that screen. Functionality-wise, it shouldn't take me long, but I want to make it look decent at the same time. Thanks Northern3D for the config! Note: Because this is a server-side change, using v3.5 will still work. 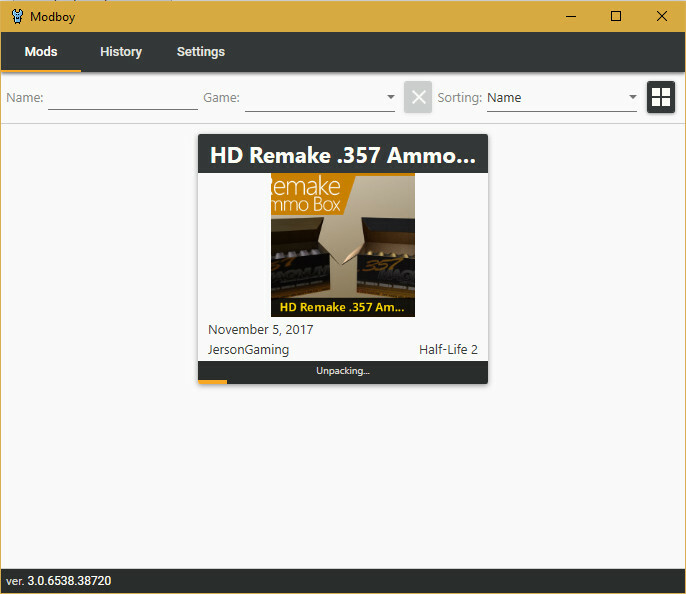 It's a tool to help download, install and manage mods available through Gamebanana for a variety of different games (listed here). Login is no longer required. 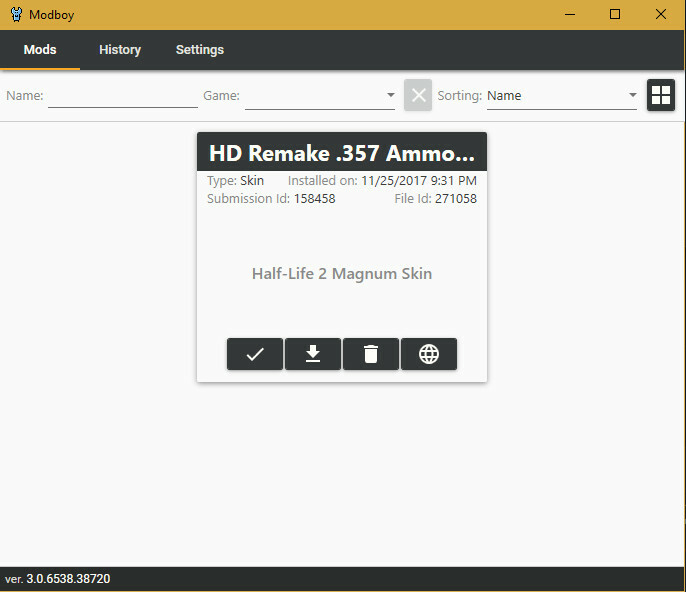 Installed mods are no longer recorded on Gamebanana. Modboy will now fail the install if it is unable to extract an archive, and notify the user as such. Old Modboy endpoints on Gamebanana are no longer used. Core GB-API enpoints have been updated to support information needed. Description of a mod is now constructed from the game name, category name and submission type. Better error handling and verbiage regarding failure to uncompress archive. Filing a bug (for the time being) consists of Modboy copying relevant data to the clipboard and opening Gamebanana to PM me. 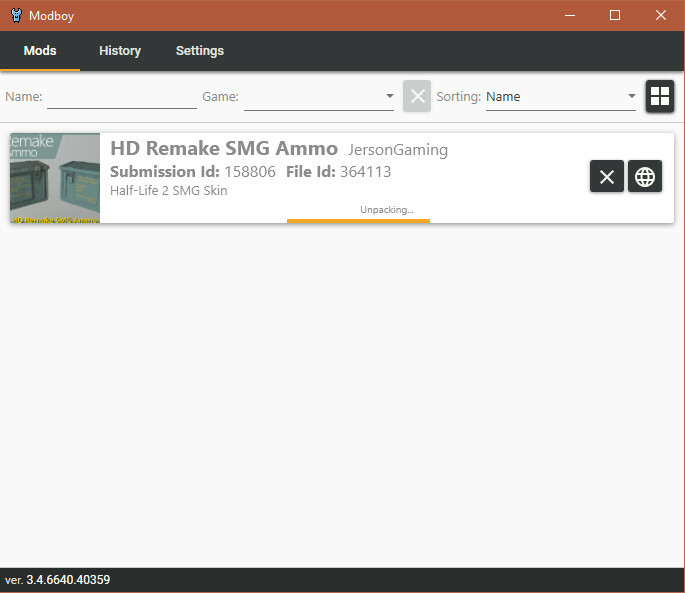 Help out by making Modboy configs for games you love! The config guide is here. Please consider rating Modboy and voting me for Tooler of the Month. Sorry to bug you again, but none of the mods that I've installed for Portal 2 seem to be working. Could I get some help with this? I'm having an issue with the latest version where it takes forever to download anything. Literally. It says it's downloading, but nothing ever happens. Could I get some help with this? i cant download anything. i have the newest ver of modboy downloaded but it wont work. i was able to use another hud from another site rn, and it still wont work when i remove the hud. I'm requesting support for my mods within this tool for ease of use. 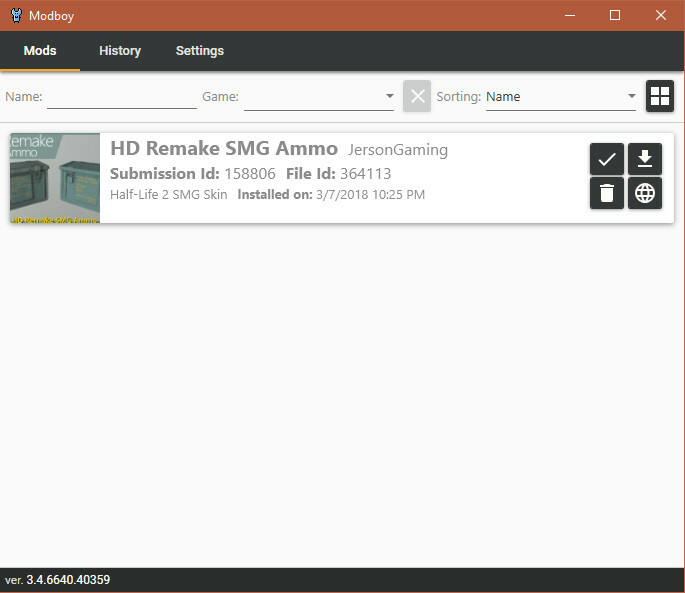 Considering that my mods are very simple - they're sorted within folders from a .zip file and contains only .vpk files (and soon, within my next pack, "[CS:GO Mod] Prisma Case Mod", .png image files), I was wondering if I can discuss methods to allow compatibility with my mods and using this installer with my mods, with a bit of tweaking to the tool to allow for direct access to subdirectories of the .zip files so that users can "select" their weapon options within this tool using a custom GUI only compatible with my mods. Further discussion on this is probably needed, as I'm looking for this tool to be my main installer for my mods. 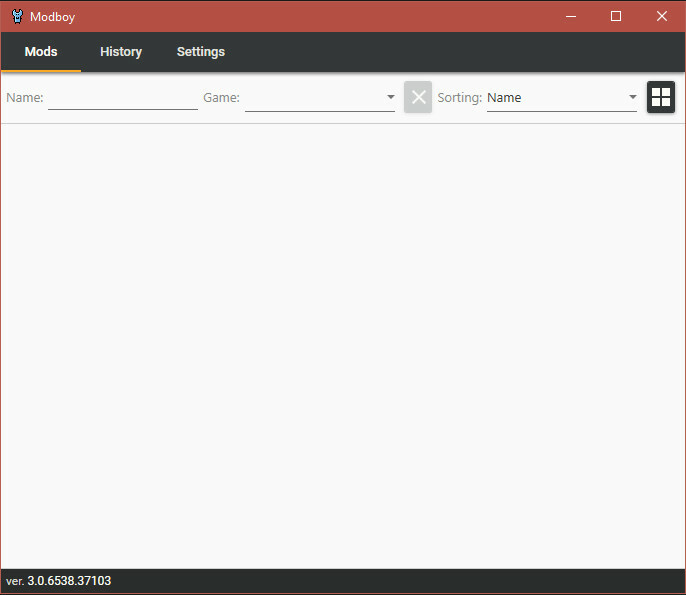 I was thinking of something like how Nexus Mod Manager utilized a GUI interface with mods that have options, such as ELFX for Skyrim, how it had the user select options for various settings of the mod. Thank you for your time, and I hope to see a developer contact me soon about this. hi, im trying to install a hitsound for tf2 and when i click the modboy link to install it, it says failed, modboy doesnt know how to install, was there something i needed to do first or? I'm using The v3.6b and at first, it worked fine but now it just won't download a single mod that I try to download with it. If you could fix it or give an explanation to This problem I would be more than happy, thanks in advance.